Count Wolkersheim attends the 1815 Vienna Congress to negotiate,to the Countess joy. Political concerns and music mix in a waltzing city, their apparently opposite attitudes testing their love. Will she behave or will he learn to waltz? Tilda Swinton set to become The Blood Countess? A revue star escapes her exhausting theatre life. By train she travels to the mountains. Alone in the wilderness and dressed only in her fur coat, she is rescued by two engineers. Willi Forst, the master of the Vienna operetta movie genre, created another little gem with this movie. The story is set in the old Vienna of the 1890's, and Hans Moser and Theo Lingen are excellent as the two rivalling butlers. The strong supporting cast, including Willy Fritsch, Maria Holst and - last but not least - Fritz Imhoff also deliver top notch performances. 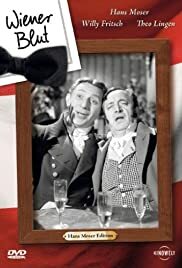 If you like this kind of movies, and also if you are a fan of Hans Moser and Willy Forst, then I also recommend the movie "Wiener Madeln" (1945).